Man City starting XI: Caballero, Sagna, Otamendi, Demichelis, Kolarov, Fernandinho, Fernando, De Bruyne, Toure, Sterling, Aguero. Three defeats in four games for City means their impressive start to the season is a distant memory. Spurs are on the up, though. This was their third straight league win and they have not lost in the league since the opening day of the season. And for the rest of the reaction from White Hart Lane, and the team news and build-up for all the 15:00 BST games, you can go here. Daniel Tinkler: Lamela told to buckle up and prove his worth by Pochettino and in the last 2 games has been on fire. So that worked then. Do you agree? Tweet using #bbcfootball or post a comment on the Match of the Day Facebook page. You can also text us from UK mobiles on 81111 - but don't forget to include your name. Joshua Bolaji on Twitter: No excuse for Manchester City about missing players, their back-ups are £30m players...please! Jack Matthews: Anything West Ham can do, Spurs can do better. What do you think? Tweet using #bbcfootball or post a comment on the Match of the Day Facebook page. City are still top - for now. Spurs are up to fifth, again for now, but I don't think they will care too much if they drop a couple of places after that performance. This was a woeful defensive display by City all round - especially by goalkeeper Willy Caballero, who was at fault for Tottenham's second goal. "He's on the bench today, and if he has got an injury why wouldn't you leave him at home and have Richard Wright on the bench? "We'll find out on Wednesday against Borussia Monchengladbach." The Spurs players are celebrating on the pitch. City's team disappeared down the tunnel as quickly as they could. "Three of the goals have been blatantly offside, but it's just the way the game goes sometimes. Spurs showed real character today and they've all turned up, Harry Kane has got his goal and they've taken their chances. After the derby defeat midweek by Arsenal this is exactly what they needed." Spurs fans are giving it the "ole" after every pass, as we go into injury time at White Hart Lane. City's defending without Vincent Kompany has been poor, and Joe Hart was badly missed in goal - as was David Silva in attack. These are worrying times for City, especially with an important Champions League game against Borussia Monchengladbach in Germany on Wednesday. Maggie in Lowestoft on text: Im in dreamland. So pleased for Kane and Lamela. No one gave us a prayer today. This will be huge for Spurs confidence and belief. Chris in Banbury: Is Nasri really good enough to be in a side going for the Title and Champions League, there's a reason why he's not selected for France. City fans should probably make the most of seeing their side at the top of the table - United host bottom-side Sunderland at 3pm and will go above their neighbours with any sort of win. Dele Alli goes into Mark Clattenburg's book for fouling Kevin De Bruyne. City have a free-kick near the left-hand corner of the area, which De Bruyne takes... but sees his shot easily saved by Hugo Lloris. The Spurs keeper has not had a very busy afternoon. Raj on Twitter: Is a hammering at White Hart Lane part of becoming champions? happened to Chelsea last year. Ben Garrett: Erik Lamela's best game in a Spurs shirt by a country mile. Have your say - tweet in using #bbcfootball or post a comment on the Match of the Day Facebook page. Yep, Sergio Aguero makes way for Patrick Roberts. He has not had a particularly productive afternoon for City. Spurs are making a change too. The impressive Erik Lamela is replaced by Tom Carroll. Michael Phillips on Twitter: Spurs got a lucky break before half time but have capitalised on it. Been far the better side second half. James Watson: Like tissue paper in water today Manchester City - not good enough! Have your say - tweet using #bbcfootball or post a comment on the Match of the Day Facebook page. City are bringing on young forward Patrick Roberts for the final few minutes - for the experience rather than to salvage the result, I would presume. Charlie Platt: Pellegrini has quite a poor record in stopping one poor result for City spiralling into several in quick succession. White Hart Lane is bouncing now... except from the corner of the ground housing the away fans. It gets worse for City too - I'm told there were loud cheers at Old Trafford when that fourth Spurs goal went in - if the score stays the same then Manchester United will go top later, if they beat Sunderland. "Wow. Fantastic. Erik Lamela just goes round Willy Caballero with four touches. Manchester City will be wondering how on earth they went from their first-half performance to this." This is a complete collapse by City now. Erik Lamela keeps his cool when he collects Clinton Njie's cross and holds off a frankly woeful attempted challenge from Martin Demichelis before leaving Willy Caballero on his backside and firing home. Another Spurs change. Son Heung-min makes way for Clinton Njie. End to end stuff at the moment. City are throwing men forward, Spurs are hitting them on the break and Harry Kane is denied by Willy Caballero. James Prezz on Twitter: I knew this would happen. I've just dropped Kane from my fantasy team. Never been happier to be annoyed at myself. Viv: Pellegrini still has not learnt I maintain, you cannot take out Yaya Toure and bring on Jesus Navas, who is not a good link up player. Spurs have the ball in the net again - but at last we have a correct offside decision. Son Heung-min gets the final touch on a goalbound Nacer Chadli header from a yard out and is flagged. A lucky escape for City but their defence is all over the place from set-pieces at the moment. City come forward again but Kevin De Bruyne is not expecting Jesus Navas's pass on the edge of the Spurs box and the home side clear their lines. Matt in Wolverhampton: I knew Kane would be able to score. Mark Manning: All the assistant had to do was watch the line while Eriksen shot. How can he have missed that clear offside? Baffling. Are City still favourites for the title? Tweet in using #bbcfootball or post a comment on the Match of the Day Facebook page. Another chance for City, but Raheem Sterling drags his shot wide. That was their best opening of the second half too. The visitors have made another attacking change now too - Samir Nasri is on for Fernando. I was about to say City are not looking much like a team about to mount a comeback, when Jesus Navas fires in a fierce shot. The Spaniard is not known for his end product but that was heading for the top corner until Hugo Lloris tipped it over. A change for Spurs. Nacer Chadli replaces Christian Eriksen, whose brilliant free-kick led to Tottenham's third goal. Nicholas Richards: It's astonishing how affected MCFC are when either Aguero or Kompany are missing. Spurs midfielder Christian Eriksen fouls Kevin de Bruyne, then kicks the ball away. Referee Mark Clattenburg spots it and books him. What a turnaround at White Hart Lane. City were 1-0 up after 45 minutes. The league leaders are 3-1 down after 65 minutes. "You keep doing the right things and Harry Kane gets his rewards. The whole crowd applaud him. As the unbelievable free-kick comes in, Kane just connects with it. There is relief from everyone that he’s scored." The resulting free-kick sees Spurs extend their lead, again in controversial fashion. Christian Eriksen bends a free-kick against the bar from 25 yards out and Harry Kane, standing offside behind the City wall when the free-kick was taken, slots the rebound into the empty net. That's Kane's first Spurs goal of the season after 748 goalless minutes and England boss Roy Hodgson, watching in the stands, cannot conceal his joy. Spurs, meanwhile, are looking very dangerous on the break. Erik Lamela is sent tumbling by Martin Demichelis - who was booked for dissent at half-time. The City defender is very lucky not to be shown a second yellow card. Still no joy for City. Raheem Sterling lets fly from the edge of the area but it is easy for Spurs keeper Hugo Lloris. Spurs have a lot of men back as they look to protect their lead. City have been here before - against West Ham last week, when they failed to find an equaliser. "It's a big loss. Everything good happening for Man City has been through Yaya Toure - he's such an important player for them." A change for City to try to change this game around. Jesus Navas replaces Yaya Toure - he will play on the right and Kevin De Bruyne will take the number 10 role. David Broome: That decision to drop Hart not looking so clever now. Tim Arstall: Just saying, I have a weird feeling Chelsea will catch Man City this season. So, how will the Premier League leaders react? Not very well so far. Aleksandar Kolarov swings in a free-kick from the left that flies straight out of play. "All the City players just look at each other because they can't believe what's just happened. You want someone to take charge - the keeper comes out and gets nowhere near it. Toby Alderweireld just showed more desire. But there's big question marks over the keeper there." Erik Lamela gets the assist here but Harry Kane deserves the credit, chasing down a lost cause and forcing Nicolas Otamendi into a foul out on the right touchline. Lamela swings the ball in, Willy Caballero comes but does not collect and Toby Alderweireld heads home. Spurs have the lead. The first chance of the second half falls for City and Yaya Toure, who meets Raheem Sterling's pass on the edge of the area with a low shot straight at Hugo Lloris. Incidentally, Toure's assist for City's goal was his fourth in seven Premier League games this season - he only made one throughout 2014-15 in 29 league matches. Phil Durrant on Twitter: Bring video technology to offside decisions in football! I can't understand why it's not in place! Matthew: Wonder how many City/Spurs fans are complaining about the other teams goal. Football fans ey? Spurs get the second half started. No changes from either side at the break. Taylor Richardson on Twitter: Chuffed that Spurs got the equaliser but this match just shows how poor the officials have been as both goals were offside. Kyle Utterson: Awful decision from Simon Beck. Walker was miles offside. The City goal was a fraction offside at best. So, two goals, two wrong decisions and a lorry-load of controversy in the first half. What will we see next? Peter Eastwood: Good of the linesmen to even things up. Excellent sportsmanship from the officials. Ashley Tezoo: City offside was marginal. Spurs goal however was nailed on offside! Assistant referees can't handle the early 12.45 start. Sam Jackson: Walker's offside makes me wonder how long football can go without TMOs, ridiculous they don't have them already. Mind you, at least De Bruyne had not just stopped. At least three of City's players were shouting at the ref when Eric Dier struck. Josh Hammond: Its a good thing these linesmen are getting the calls wrong otherwise nothing would have happened in this match! Pan: Two offside goals, these linesman are incompetent. What did you thnk of the first half and the two goals, did the officials get both wrong? Quote Message: The goal seemed to happen in slow motion. No-one expects Eric Dier to shoot and he gets his head down and puts his foot right through the ball. It's sloppy from Manchester City as they had the chance to clear. It gives Spurs something they did not deserve. The goal seemed to happen in slow motion. No-one expects Eric Dier to shoot and he gets his head down and puts his foot right through the ball. It's sloppy from Manchester City as they had the chance to clear. It gives Spurs something they did not deserve. City definitely think there was at least one offside in that Spurs goal and they are right - Kyle Walker was a mile off when he was played in before delivering the initial cross. Martin Demichelis is booked for arguing his point as the players come off at half-time, but Spurs can rightly say that City's goal should have been chalked off too. A strange one this and, again, more than a hint of offside as Spurs equalise. Neither side can keep the ball at the moment, but a succession of misplaced passes ends with a shooting chance for City, with Aleksandar Kolarov flashing in a shot that Hugo Lloris does well to keep out. Quote Message: Harry Kane is not making the runs we are used to him making and Son Hueng-min is not giving his team-mates options either. Tottenham look very static and poor going forward. Harry Kane is not making the runs we are used to him making and Son Hueng-min is not giving his team-mates options either. Tottenham look very static and poor going forward. Rob Bown: I know Sterling isn't the finished article at 20, but he worries me every time he gets the ball - seems to give it away cheaply. Mark Taylor: It's now over 27 hours since the two England strikers have netted in the league. Tottenham's best effort of the first half. Some good work by Erik Lamela sees the ball fed to Harry Kane - he has to dig the ball out from under his feet on the edge of the box but still gets a shot away, which brings a diving save from Willy Caballero. A decent spell of passing and possession by Spurs ends when Jan Vertonghen puts the ball out of play. They are getting Christian Eriksen on the ball more and more - but City are holding firm at the moment. City threaten again, with Fernando's cross-shot forcing Hugo Lloris into action. Spurs are still trying to get back on level terms but their finishing remains, erm, unconvincing - Erik Lamela is their latest player to fail to find the target after blasting over from a Ben Davies cross. Rabin: De Bruyne scored that goal, but its all about power and pace by Yaya. Oladayo: Kevin De Bruyne - Money well spent so far. Kevin Boissinot: Awful pass from Walker to allow City to break. Dreadful from Spurs. Get in touch using #bbcfootball or post a comment on the Match of the Day Facebook page. That missed chance came at a bad time for Harry Kane. It's now been 12 hours since he scored his last competitive goal for Spurs. A decent chance for Tottenham, this, following Nicolas Otamendi's mistake. Harry Kane has the ball in a dangerous position, and he has support too, but elects to go for goal himself... and sees his shot from the edge of the box fly well wide. A waste - and there will be no end to his drought with finishing like that. Quote Message: The goal is so disappointing from a Tottenham perspective. They lose the ball from a corner cheaply and Yaya Toure puts on the after burners and is he going to pick the right pass, of course he is. Yaya is walking a bit slowly now. The goal is so disappointing from a Tottenham perspective. They lose the ball from a corner cheaply and Yaya Toure puts on the after burners and is he going to pick the right pass, of course he is. Yaya is walking a bit slowly now. Here's that City goal in graphical form. What it doesn't show you is that there was a hint of offside about Kevin de Bruyne when he collected Yaya Toure's pass. Replays show the Belgian's toe was offside, at the very least, but the linesman did not flag. This game has livened up since that goal... quite a bit too. Tottenham look to hit back and Christian Eriksen finds Son Heung-min on the left of the area, and he forces a low save from Willy Caballero at his near post. Then City come forward again with Raheem Sterling forcing Hugo Lloris into a sprawling stop. Maybe Spurs were better half staying deep. City spring out quickly from a Tottenham corner, with Yaya Toure leading the charge. He has options right and left... and opts for right, playing in Kevin de Bruyne to bury his shot past Hugo Lloris for his third goal in three starts for his new side. Here's another example of how City are getting more men forward, albeit to little attacking effect so far. As BBC Radio 5 live's Jason Roberts has spotted, Man City right-back Bacary Sagna is playing high up the pitch. In terms of possession, this game is still dead even at 50% each but most of the play is taking part in the Tottenham half, as you can see from this graphic showing the average position of touches by players from both sides. City defender Nicolas Otamendi has had the measure of Son Heung-min so far, and makes another timely challenge here. Spurs have a corner, taken by Erik Lamela, but City clear. "Manchester City right-back Bacary Sagna is in such an advanced position and Tottenham's Christian Eriksen is remaining honest and tracking back, which is why we are not seeing the Spurs midfielder on the ball as much." As discussed, Sergio Aguero has a superb record against Spurs. He is out of luck this time, though, seeing his curling shot from 25 yards pushed away by Hugo Lloris. Exactly 50% possession apiece so far, and both sides struggling to create chances. City have had the most recent attacks - with Yaya Toure's snap-shot rolling wide and Fernando's effort charged down by Eric Dier - but they are not exactly knocking on the door. "Sergio Aguero has a ridiculous scoring record against Tottenham and it is interesting to see the intensity of the Spurs defenders when he gets the ball. But Tottenham need to be careful about their closing down in midfield and up front." As for Spurs? Well Harry Kane has not had a shot yet, never mind a goal, but he is looking lively, beating Martin Demichelis very easily before being crowded out inside the area. The home side kept up a decent spell of pressure and Erik Lamela had their first effort at goal, but it was deflected wide. The first shot of the game comes in the ninth minute, and City are behind it. Kevin De Bruyne lets fly from 25 yards out but his dipping effort bounces wide. City have not done much in attack either but Spurs keeper Hugo Lloris almost inadvertently changes that with a horribly mis-cued clearance. It falls for Raheem Sterling but he handballs as he tries to control it and referee Mark Clattenburg stops him in his tracks. Tottenham's first attack sees Son Heung-min link up nicely with Harry Kane but Erik Lamela is offside as he runs through on goal. Vincent Kompany was originally listed as one of City's subs today but after watching him in the warm-up they have decided not to risk him. George Evans is on the bench instead. City have hardly let Spurs have a kick yet. Manuel Pellegrini's men have just had a corner, but Kevin de Bruyne's delivery was easily cleared. 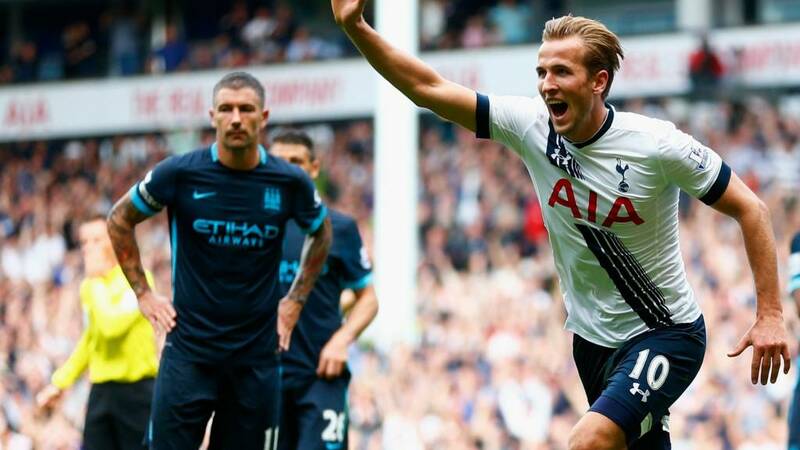 "The longer Harry Kane's goal drought continues the more it will play on his mind. "I have a bit of an issue with Spurs on this issue because it should be a option to take him out of the firing line but they can't because Tottenham did not bring in another striker." City get the game started. It looks like Yaya Toure will be playing further forward than usual for them today, in the number 10 role behind Sergio Aguero. The September sunshine is still shining brightly as we move closer to kick-off. "Glory Glory Tottenham Hotspur" is being blasted out of the tannoy at White Hart Lane and we are seconds away from getting under way. "Kevin de Bruyne has done very well. He isn't a winger - he can play inside. He doesn’t want to be the star of the show – he's a provider. "There’ll be no pressure on him as they have so many superstars. If he doesn’t do it one day, they have another four or five that can. "Sergio Aguero is 100% fit. Vincent Kompany is back. City played well against West Ham despite losing – I don’t think the morale has been dented too much. "If David Silva and De Bruyne link up, Aguero will be easy pickings." "Spurs have defensively got it right. Dele Alli is a real player – I like people who step up through the leagues. They’ll be OK but it’s the battle for top six again. "I think Manchester City will win this. I thought they were excellent against West Ham in their last game despite losing." The players are in the tunnel at White Hart Lane. Not much chit-chat going on between the two teams, because they are about to get down to business. Manchester City manager Manuel Pellegrini speaking to BT Sport: "Joe Hart had an injury problem in week so that's why he couldn't play. He just worked one day before the game so it is better not to take a risk. "We have 15 points from 18 which is a good start. We will try to recover from the defeat last week. Tottenham is a difficult team but it is important to continue playing the way we have so far." I don't want to worry Spurs fans but 12 of those 17 goals I mentioned at 12:30 have been scored by City, who have handed out a couple of 5-1 thrashings here since 2011. Spurs have lost three of their last four home games against City, with their only success since December 2009 coming in April 2013 when a certain Gareth Bale scored in a 3-1 win. A heck of a lot has changed at The Lane since then. Tottenham boss Mauricio Pochettino speaking to BT Sport about Harry Kane: "Always in football you need to have patience, trust and belief. Harry knows he needs to try and try and try and work hard. "We believe in him and we hope he will score today. This period will be great for him as a player in the future." This fixture has seen a few goal-fests in recent seasons - a total of 17 goals have been scored in their last four meetings at White Hart Lane. It's not looking good for something similar today, mind. On top of the out-of-form strikers I mentioned earlier, these two sides have the best two defensive records in the Premier League this season. The two goals City conceded in their home defeat by West Ham last week are the only time their defence has been breached. Spurs have also been impressive at the back, conceding four times in their six games so far. He says: "Dele Alli likes to get forward for Tottenham, and I understand why, but he will have defensive work to do on Saturday and, if City have a lot of the ball, I think they will win. "I cannot see Tottenham trying to replicate the counter-attacking tactics that worked for West Ham against City last week, and I am not sure they could do it successfully even if they wanted to." For those of you wondering why Joe Hart is only on the bench for City, he picked up a slight back injury in midweek and has only trained once this week - on Friday. Willy Caballero comes in for his first Premier League start since New Year's Day. Well it is today, anyway. It's a glorious afternoon in north London, as you can see from these tweets by Match of the Day commentator Alistair Bruce-Ball. Spurs make wholesale changes from the midweek cup defeat to Arsenal as manager Maurcio Pochettino returns to his first-choice XI. Harry Kane leads the line, looking for that elusive first club goal of the campaign. Manchester City spring a surprise or two as goalkeeper Joe Hart and captain Vincent Kompany are left on the bench. They make just one change from the side which beat Sunderland in midweek - as Fernandinho comes in for Jesus Navas. It's not all doom and gloom for Spurs, though. Far from it. I'd love to claim credit for that headline above but I first saw it in The Times after Son Heung-min got off the mark for Spurs in their Europa League win over FC Quarabag. Son struck again in Tottenham's 1-0 win over Crystal Palace last weekend and with three goals in three starts he has added some much-needed bite to their attack. City also have a new signing making a splash in Kevin De Bruyne. The £54m man has got two goals in two starts for City and he will looking to continue that excellent start today. "I feel for Harry Kane. He’s got more strings to his bow than scoring goals. He’ll be a top player. I worry about Spurs – where they’re going. I think they’ll be sixth or seventh again as usual. "Kevin de Bruyne has fitted in seamlessly at Manchester City. The key is keeping Sergio Aguero fit. I don’t know why they sold Edin Dzeko. If they keep Aguero fit I think they can win a lot of things." The good news for Spurs is that Sergio Aguero is not exactly in red-hot goalscoring form right now. The Argentina frontman was the Premier League's top scorer in 2014-15 with 26 goals but so far in 2015-16 he has scored just one goal in six games for City, and his shot conversion rate has dropped from 22.61% last season to 6.67% in this campaign. Mind you, Spurs have their own out-of-form striker in Harry Kane. His stats have also dropped off the proverbial cliff, and he is yet to find the net for his club this term. You can read more about the goal drought that has affected some of the most prolific marksmen in the game, here. Welcome to White Hart Lane. The bad news for Tottenham fans is that when Manchester City come to town, Sergio Aguero usually scores... will today be any different? Welcome to our live page for Tottenham v Man City. We'll have text commentary here from 12:00 BST, plus you can follow radio commentary of this game via the live coverage tab. You can keep up to date with all the build-up to today's games here.